To call a large cove, bay or inlet, fenced off in the front, and with literally miles of room for the orcas to swim and live in a natural environment a “sea cage” is a bit rich coming from SeaWorld. If such a sanctuary is a “cage”, what exactly do they call the concrete tanks of SeaWorld? 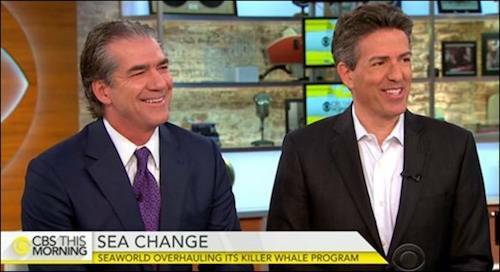 It was all a bit too good to be true: the CEO of SeaWorld and the president of the Humane Society of the U.S. getting together on TV to announce SeaWorld’s plan to stop breeding killer whales and to support ocean conservation programs. But even as they were making the announcement and smiling together, SeaWorld was preparing a PR and advertising blitz trashing animal protection organizations with a series of blatant untruths. Some say “Free the whales.” For them nothing else is acceptable. But nothing could be worse for the whales. Most of the orcas at SeaWorld were born here. Sending them into the wild wouldn’t be noble. It could be fatal. But who is SeaWorld talking about when they claim that “Some say ‘Free the whales. '” They don’t say, and I know of no responsible animal protection group that’s advocating any such thing. Maybe some crackpot somewhere, but certainly none of the organizations, scientists, engineers, ocean preservation groups that are working together to create a plan for the first North American seaside sanctuary. Some critics want us to go further; they believe we should simply “set free” the whales and release them into the ocean. Again, who’s he talking about? Rather than being specific, he simply moves to a second untruth. Never in the history of mankind has an orca born under human care survived a release to the wild. The most famous case is Keiko, the whale from “Free Willy.” Even though Keiko was born in the wild and millions were spent preparing him for release, after being released he died from pneumonia and starvation. We’re not going to take this risk with SeaWorld’s whales … The effort was a failure. And he perished. The facts are, of course, entirely otherwise. Keiko was rescued from a marine circus in Mexico, where he was sick and dying from starvation and a skin infection. He was rehabilitated and nursed back to health (with support from Dr. Lanny Cornell, a former lead SeaWorld veterinarian), until he was ready to live in the ocean. His was an amazing transformation: from listless, underweight, and in poor health, all the way to swimming with wild whales in his native waters in Iceland where he was born and from where he was taken captive at age two. From Iceland, he then swam all the way to Norway, where he made a new home for himself, living in a large enclosed bay for the latter years of his life with many weeks of forays in the open ocean each year. And so to SeaWorld’s third untruth. There are those who claim that simply establishing areas that are fenced in, or essentially sea cages, is the answer for the orcas at SeaWorld. This would be as dangerous for the whales as simply releasing them into the ocean, and could in fact be worse. The whales] would not be able to handle the ocean’s man-made pollution or naturally occurring diseases. Stuck in these cages, they would be helpless to avoid contagious diseases, parasites and pollutants. They would be sitting ducks, stuck in one place no matter what the tide brings in, whether it’s an oil spill or a hurricane. That a risk we simply won’t take. The fact is, it is keeping orcas in barren, concrete tanks that’s a detriment to their psychological and physical health. 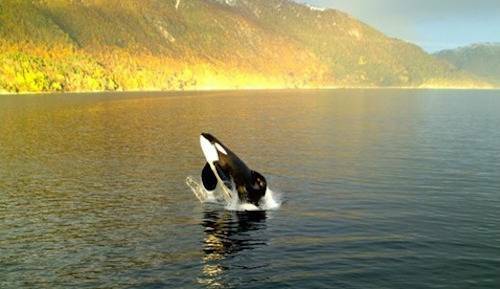 Killer whales are perfectly adapted to life in the ocean. They are far-ranging, top predators with incredible intelligence and complex social lives. The psychological deprivation and physical stress of SeaWorld’s small, artificial concrete tanks causes suffering and shortened lives. Meanwhile, right now, at SeaWorld Orlando, the company’s best-known whale, Tilikum, is dying from a highly resistant bacterial infection that the company’s veterinarians have been unable to cure. Nor can they explain how he contracted this infection. All evidence suggests that sea sanctuaries can provide a more spacious, enriching, dynamic environment to promote orca health and wellbeing. In fact, current research strongly indicates that dolphins housed in sea pens do better than those in concrete tanks – they behave more normally, they are less stressed, and they even have better survival rates. The very idea of releasing these orcas to sea cages ignores the fact that sea cages for orcas do not currently exist anywhere in the world. Well, it’s certainly true that there are no seaside sanctuaries … yet. (And really, SeaWorld, let’s drop the “sea cage” thing.) Already, many marine mammal protection groups are working together to locate suitable sites – inlets, coves and bays – that could be good locations for seaside sanctuaries for orcas and other whales and dolphins. Rather than partnering with them, SeaWorld is trying to preempt the whole idea with a series of false statements designed to persuade the public that the tiny concrete tanks in which they hold these captive animals are the only viable option. Viable, SeaWorld hopes, for keeping the company’s stock afloat, maybe. But certainly not for the health and welfare of these captive animals.